The energy and metals markets have been rife with drama for the first five months of 2018. The rise of international political tension and trade disputes drove much of the volatility in the prices of industrial metals and steel, with some repercussions felt in the equities of this segment. Perhaps just as important has been the transition underway this year towards a monetary and financial era characterized by rising interest rates and increased financial market volatility. Molybdenum (“moly”) price strength moderated after touching a high of $13/lb in early March, trading above $11 in May. This was in line with the plateauing of industrial metals in the past couple of months. What is particular about moly is that it is witnessing robust demand from the energy industry, which has been rejuvenated by a healthy increase in oil prices. Approximately 45% of moly’s end use is in energy and transportation, which include the oil and gas, power generation, automotive and other transportation sectors.The petrochemical and chemical industry accounts for another 15% of moly end use, according to the CPM Group, a commodities research firm in New York. Compared with equities, metal and energy commodities typically follow different sets of economic and international political factors. As hard assets, metals and energy have been shown to outperform in the late stages of business cycles. In the last Moly Bits, we noted that industrial metals are trading at a deep “discount” relative to the overall equity markets and that the prices of commodities are inexpensive relative to their long-run averages after a protracted downturn from around 2012 through 2016. The Brent Crude oil price approached the $80/barrel mark on May 23, the first time it touches this price since 2014. The West Texas Intermediate (WTI) crude broke above $70/barrel during the same week. The rise in oil prices was bolstered by market concerns about U.S.-imposed Iranian sanctions, a continuing decrease in Venezuelan production, and a drawdown in oil inventories. Oil prices remain strong despite recent pullback upon the latest news that the Saudis and Russians would ease OPEC production limits to ensure adequate supply. Led by an increase in drilling in the United States, worldwide oil and gas drill rigs were up 9% to 2,087 in April 2018 from a year ago, according to Baker Hughes. U.S. drilling increased 19% year-on-year to 1,011 rigs in April 2018. The U.S. overtook Saudi Arabia as the world’s second-largestcrude oil producer in 2017 and is projected to become the largest oil producer next year, according to the International Energy Agency’s (IEA) Oil Market Report 2017. In addition to enhancing national energy security and providing cost-competitive supplies, the domestic oil and gas industry is a major contributor to the U.S. economy. In a 2017 study commissioned by the American Petroleum Institute (API), the direct and indirect economic impact of the oil and gas industry was estimated at $1.3 trillion, or 7.6% of U.S. GDP in 2015, when the WTI crude price averaged $49/barrel. Capital investments typically lag the commodity price cycle. Every segment of the energy industry – from drilling for reserves discovery to downstream transportation, distribution, and storage facilities – require moly-bearing steels. The API announced that during the first quarter the U.S. saw a 37% increase in oil and gas well completions, with an exploratory success rate above 60%, its highest since 2009. The rapid expansion of U.S. shale production has been stymied by the lack of infrastructure capacity to transport and export such energy output, which is a major reason the WTI crude price gap has widened against the global Brent Crude price. Despite many years of pipeline expansions, much shale capacity in Permian and Eagle Ford basins in Texas continues to endure a lackof access to the Gulf Coast. The rate of energy infrastructure expansion will set the pace for garnering international market share by U.S. oil and gas producers. This is important for moly as the U.S. oil and gas industry will seek to fix its logistical bottlenecks, and the fixes involve moly-bearing pipelines and facilities. The U.S. Department of Energy’s Economic Information Administration (EIA) predicts that the U.S. will become a net exporter of energy by 2022, for the first time since 1953. This is largely driven by the development of Liquid Natural Gas (LNG) facilities and export terminals. The first LNG export terminal, Cheniere’s Sabine Pass facility in Louisiana commenced operations in 2016. Another facility, Dominion Energy’s Cove Point liquefaction terminal in Maryland completed construction in January 2018. Four additional LNG terminals in Georgia, Texas, and Louisiana are expected to be online in 2018 and 2019, according to the EIA. Total U.S. liquefaction capacity is expected to increase to 9.6 Bcf/d by the end of 2019 from around 2.8 Bcf/d at the end of 2017, according to the Federal Energy Regulatory Commission (FERC). Another four more new projects with a total of 6.8 Bcf/d of capacity have been approved by the regulators and are ready to commence construction, stated FERC. The LNG trade increased 22% over a three-year period from 2014, and is expected to increase by another 21% by 2020, according to the Institute of Energy Research. Higher producer profit margins from a rising oil price, improvements in the cost-efficiency of drilling, and continuing strong demand from Asia, particularly from the world’s largest importer of oil, China, will drive further growth in capital investment over the long term. In addition to producing more energy, the U.S. will also make strides in producing cleaner fuels over the long term. The International Maritime Organization (“IMO”), a United Nations agency responsible for international shipping standards, requires a reduction in sulfur in fuel oil used on board ships to 0.5% by 2020 from the typical 3.5% presently used in most regions of the world. The implementation of such standards is bringing the most significant change in fuel specifications in the oil product markets going forward. Despite their 4% share in global oil demand, marine bunkers account for 40% of sulfur emissions from the use of oil, according to the IEA. Given the size of the modern global fleet, it will require major upgrades in the maritime industry to switch to cleaner fuel during the medium term. This will also increase demand for lower sulfur distillate fuels, which could have a meaningful impact on moly end use in catalysts. Approximately 8% of moly first use in catalysts, as molybdenum trioxide, is a critical component in petroleum refining and petrochemical catalysts utilized in the hydrodesulfurization (HDS) process. The energy demand growth story is not merely a U.S. development. Indeed, most of the demand growth is and will continue to occur in Asia and outside of the United States. Major expansions in refining capacity are being recorded in Asia, particularly in China and India. While the growth of China’s appetite for energy and metals has slowed relative to the past, the levels of demand and the throughput in refineries continues at high levels and continues to increase. The growth is from a much higher base and involves more oil and more moly-bearing steel. The IEA’s Oil Market Report 2017 noted that India consumes only 1.2 barrels of oil per capita per year compared with China’s 3 barrels per capita per year. By 2022, India’s per capita oil consumption is estimated at 1.5 barrels per year, while China’s per capita oil consumption will grow to 3.5 barrels per year. African light sweet crude production is also ramping up. The Figure 3 chart below of Global Refinery Capacity Additions shows the impact of new refineries in Angola and Uganda in 2022. BP’s Energy Outlook 2018 predicts that global energy demand will increase by one third from the current level over the next 25 years. Total energy growth would be projected to rise even more sharply, but part of the increased demand for energy is being offset by rapid gains in energy efficiency. 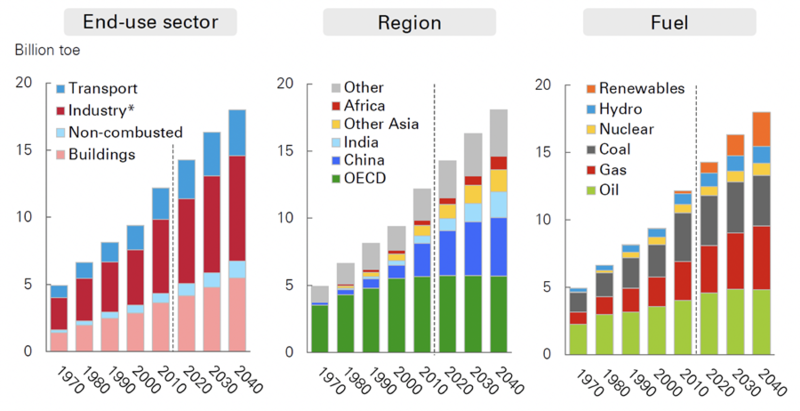 China, India and other Asian countries will account for two-thirds of the energy demand growth by 2040. Of this expected increase, 70% is from power consumption. Global energy consumption has risen in tandem with expanding economic activities around the world, driven by increasing productivity in the developing worlds, growth in population, and urbanization. The World Bank projects global economic growth at a solid 3.1% for 2018, after a better than expected 3% growth in 2017, which was facilitated by a recovery in investment, manufacturing, andtrade, as well as firming commodity prices, to the benefit of commodity-exporting developing economies. Advanced economies are expected to slow to 2.2% growth in 2018 from 2.3% in 2017, according to the World Bank. Meanwhile, the emerging economies are expected to grow 4.5% in 2018 compared with 4.3% in 2017. The World Bank is forecasting that China’s economic growth slows to 6.4% in 2018 compared with a robust 6.8% in 2017. However, today’s Chinese economy is massive and is consuming more in aggregate, and it is not surprising to see its base materials industries outperform the past years. India is projected to grow at 7.3% in 2018 versus 6.7% in 2017. Indonesia’s growth is estimated at 5.3% in 2018 versus 5.1% in 2017, according to the World Bank. The World Steel Association recently provided its updated outlook, expecting a further recovery in global steel demand by 1.8% year-on-year to total 1.6 trillion mt in 2018. Another 0.7% year-over-year increase is expected in 2019. While China’s 2018 steel demand is expected to be flat year-over-year, emerging economies excluding China are expected to record growth of 4.9% in 2018 and another 4.5% in 2019. The positive outlook in steel demand is consistent with the robust state of world crude steel production, which was a record 1.7 trillion mt in 2017. More than 70% of moly’s first use is in steel production. China is the world’s largest steel producer, accounting for approximately 832 million mt or 49% of global steel production in 2017. The hot pace continues this year. World crude steel output was up 4.1% year-on-year (YOY) to 427 million mt in the first quarter 2018 and by the same percentage increase YOY to 148.3 million mt in April 2018. During April 2018, crude steel production was up 4.8% in China and 5.6% in India. China’s April production of 76.7 million mt was a record, as our friend and metals analyst John Tumazos of John Tumazos Very Independent Research pointed out. U.S. crude steel production climbed 5.3% YOY in the first quarter 2018 and 3.6% YOY in April 2018. The steel and moly outlook for China reflects its government-directed supply-side reform to curb excess steel capacity, including closing substandard and illegal facilities. Meanwhile,there are demand drivers including the controlled but still vigorous real estate investments and new public construction projects. 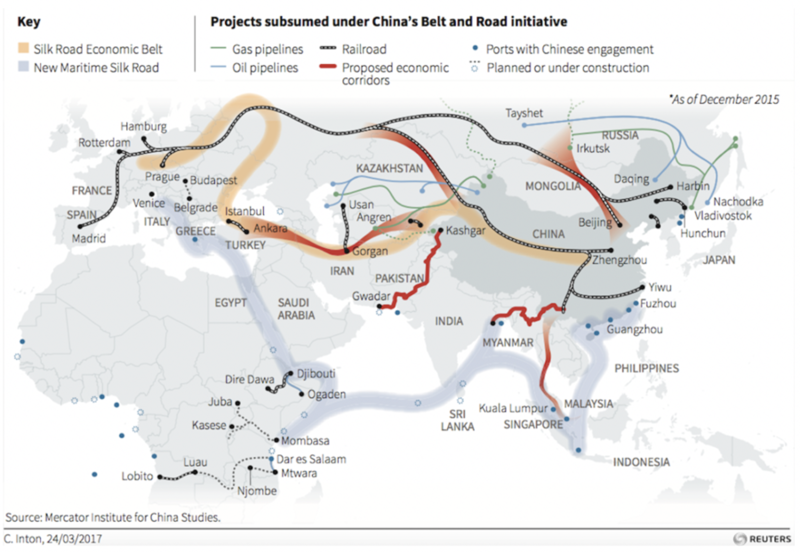 In addition, there is much steel and metal demand to be expected from the China-led $1 trillion Belt and Road initiative, allegorically the modern Silk Road, linking 70 countries and directing investments in transportation and power infrastructure. In 2017 China accounted for approximately 36% of the global moly use, while it produced more than one-third of global moly supply, according to the International Molybdenum Association (IMOA). Total global moly demand in 2017 was just one million pounds shy of the record high 559 million pounds in 2014. This strong demand is being reflected in a further drawdown of available inventories. Total global moly demand is expected to increase 9% while supply is to grow 13% in 2018 over 2017, noted the IMOA. Moly consumption, driven by the resurgence of oil and gas drilling and rising steel consumption, pulled moly prices 52% higher during 2017 to close the year at $10.25/lb. The moly market is approaching an equilibrium in supply and demand in 2018 and is expected to dip into a deficit of 7.1 million pounds in 2019, according to the CPM Group. These positive fundamentals could lend further strength to moly prices. The increasingly robust oil and gas industry bodes well for more moly-bearing steel for longer life, stronger, tougher, bendable, and corrosion-resistant pipelines, stronger tubular goods, offshore platforms, container ships, and processing facilities, as well as moly use in catalysts. Global economic growth continues to be positive in 2018 compared with the exceptional 2017 in view of rising oil prices and easing trade tensions. I communicate regularly with global bankers, metals analysts, and our strategic partner and largest shareholder, AMER, as well as with our 20% partner in the Mt. Hope Project, POS-Minerals, which is a subsidiary of Korean steel conglomerate POSCO. We have had a lot of discussions about the markets. The discussions typically focused on positive trends in moly demand and expectations of further increases as the global economy continues through this stage of the cycle. We expect that we will see more days of market pullbacks during this year than in the past, but with the continued majority of positive corporate earnings, we see no hard landings in either the global markets or metals this year and into the next. While there is heightened caution in all markets, we believe the global players will not leave money on the table by folding too soon and this late cycle of synchronized economic expansion can extend its delicate balance through 2019. We are all buyers and sellers, whether as corporations or governments, looking to make a deal. The world remains open for business and needs metals and energy. Moly Bits is a blog published by General Moly, Inc. The prior issues are available by clicking here. Bruce is Chief Executive Officer and a Director of General Moly, who is a Rockies baseball fan and a former Colorado School of Mines pitcher, and who believes moly is in the early innings of a price recovery.